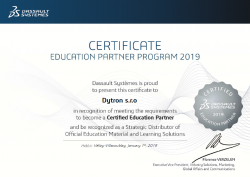 We are a certified education partner of Dassault Systèmes for the CATIA, ENOVIA, DELMIA, and CATIA Composer systems. However, we do not only offer standard training for the required system version, but also education customized to the needs of individual customers. Since 1995, we have trained more than 2,000 users in over 100 notable companies, particularly in the aerospace and automotive industries. We would be glad if yours became one of them. Why should you go for it with us? We enjoy long-term close contact with the software producer, which is positively reflected in the quality of our training. Our instructors approach each participant individually. Emphasis is placed primarily on work procedures using the task-based approach. The use of e-Learning services for self-study or to revise trained knowledge is a matter of course. Above all, we optimize your learning processes and raise your employees’ use of the software several levels higher. We train using Dassault Systèmes education licenses in our training classrooms. We use the official documentation and the curriculum of CATIA and ENOVIA courses directly from Dassault Systèmes. The documentation is optimized for the needs of most effective educational process. Training materials for official DS courses are sold in printed form, with included official 3D training data. As a certified Education Partner, we have a license to translate official training materials. The documentation of CATIA and ENOVIA courses is therefore translated into Czech. We currently have four modern training centers in Novy Jicin, Prague, Mlada Boleslav and Liberec. These centers are equipped with high-performance computer technology, a corresponding number of training licenses, and offer a range of amenities and pleasant background for your study. The capacity of the classrooms is 8 to 10 working places. Our training centers are very easily accessible from the main roads and classrooms are air-conditioned. Classrooms have an inter-connected computer network, data projector, and notice board for illustrating each feature. 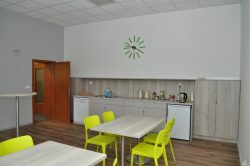 Participants on the training course are provided with a relaxation room, including a kitchen with a light refreshment. However, we can also provide high-quality teaching for you using fully-equipped mobile workstations. is the world leader in CAD/CAM/CAE technology. The system offers a wide range of solutions integrated into one environment for all aspects and areas of product design and development. Working in 3D based on a single database, linking to PLM systems, support for drawing-free manufacturing, ensuring collaboration in teams, optimizing technological processes, reducing costs and increasing company competitiveness. is a comprehensive business solution for managing both technical and non-technical documentation, product structures and their variants, projects, customer requirements and product or project information. It offers users a wide range of options to share and exchange product information, throughout the entire lifecycle, and facilitates mutual collaboration not only among users and business departments, but also with suppliers and customers. enables manufacturers in all industry sectors to virtually define, plan, create, monitor and control manufacturing processes. The main advantages of the system are the reduction in NC programming time and ensuring the creation of a no-collision path for the tool. Improving program accuracy by simulating the real behavior of complex machining tools increases productivity by eliminating traditional data processing. The cost of training depends on the number of training hours and how the licenses for the trained system are used. Customers who purchase both CATIA software and workstations through our company are provided with significant discounts on their training. If you would like us to send you the price list of individual training courses, please contact us: roman.kena@dytron.cz, tel. +420 737 200 541 . DYTRON has trained more than 2000 CATIA users and more than 100 companies in their training centers. The range of 80 teaching hours responds to the CATIA V5 Basic Course. Due to accreditation, the training fee is exempt from VAT (pursuant to Section 57 (1) (d) and Paragraph 2 of Act No. 235/2004, on Value Added Tax); part of the costs may also be paid by the Labor Office local to the employee’s place of work (the contribution must be requested by the employer). Development Group Leader, BRANO a.s.
“The main benefit regarding construction was that we now have 100% order in the data. Previously, some designers stored data on their local drive, then another designer came in, needed to work on the data and took an older version. This stopped when we switched to ENOVIA. We have all the data in PLM, so the designer is always working with the latest data version or can see that someone else is working on it. “Because ENOVIA has enabled us to manage data, or more precisely, all information through any number of links, this has meant that we always have the right information on hand, and thanks to the possibility of web access, we’re able to access this information anywhere at any time. “Collaboration with DYTRON s.r.o. on developing CAD methodology has helped us to map and better understand the design procedures in the creation of the CAD model, and subsequently to optimize and standardize them. CATIA V5 Team, VOLKE Mlada Boleslav spol. s r.o. Product Development Manager, KIEKERT-CS, s.r.o.